The air museum counts 140 valid historical bldg. The smaller constructions such as bakovens or rennen for bird are not counted in here. Although the oldest bldg. of 1507 dates, the collectie exists mainly from construction work of the late 17th to end 19th century. The emphasis lies in particular on agriculture courts and - scour. Moreover also daily important bldg. for the dorpsleven (blacksmith, school, church, inn and hand worker bldg.) have been incorporated in the collectie. During the early advancement of the air museum (1953 - 1958) it was aimed gezocht to bldg. of historically bouwtechnische value or bldg. with typical style characteristics for a specific region. The most of bldg. found oneself then already in a far-reaching state of decline. With a view to later reconstructie, these expire bldg. were demolished. This moves a time-consuming process was where one numbered each object, subscribed in an inventory and construction plan to build vervolgens nauwgezet. One restored all bldg. to in their most original core. Already the bldg. come from several regions in Flanders, in the air museum they have been brought together as representative rural cores. Flemish villages did not change fundamental between the late middle ages and the first world war. The air museum brings a well-considered picture of the dorpsleven during the new time and the vroegmoderne time. By the modified heritage legislation in Belgium and Flanders bldg. of historical value can be conserved only still in situ. Bldg. from their original context obtain and build elsewhere, are possible no longer. This means that the gebouwencollectie of the air museum of Bokrijk no longer grow. Great capture and soft colors!!! Thanks for the notes, my friend! 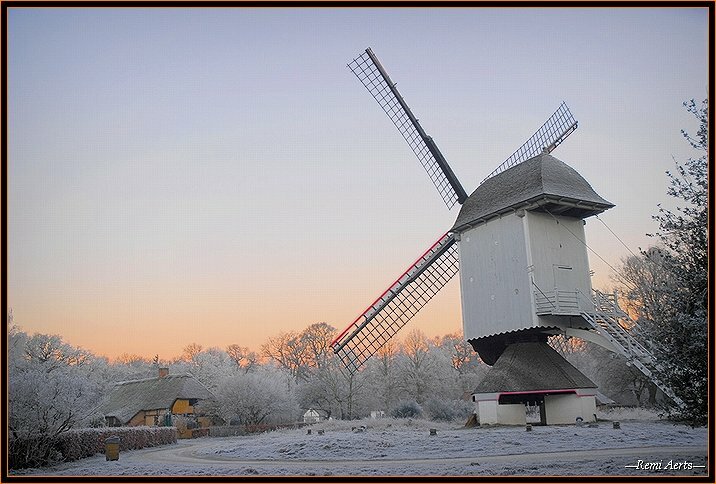 Wonderful winter atmosphere, so nice with the mill in the background! How wonderful it looks! What a beautiful wintry atmosphere here! Excellent work. Very good composition!